Bookmarking a specific location at the global map is a very helpful way for emperors. You can add your new tags, rename them and assign bookmarks to them so you order them according to your plans. 1. Find a teritorry or castle on the global map. 2. Click on it to view the options from the wheel. 3. Click the bookmark icon. The bookmark menu gives you information about the bookmarked lication's name or coordinates, ruler, distance from your city and the tags that you assigned to it. You can edit and add tags at any time as well as remove the bookmark from your list. 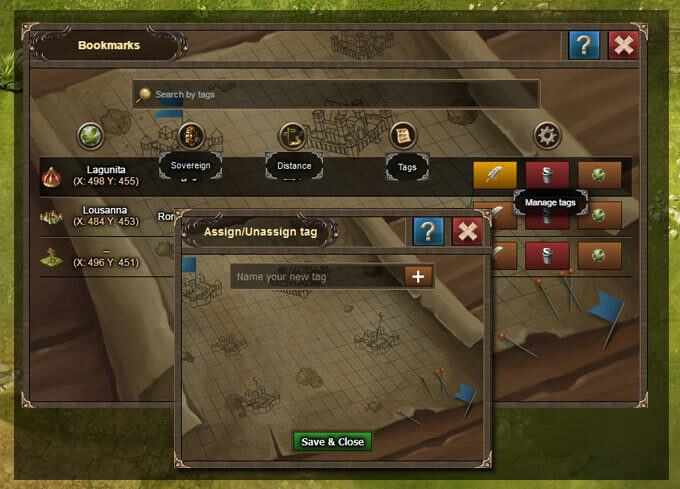 - To assign bookmarks to tags, click on feather icon for a chosen bookmark. Write the tag (+15% wood or Weak opponent) and click the "+" to add it to the list. Then click to assign it and save. 4. In order to move to a bookmark just open the list on the main navigation bar and select a castle or teritorry.